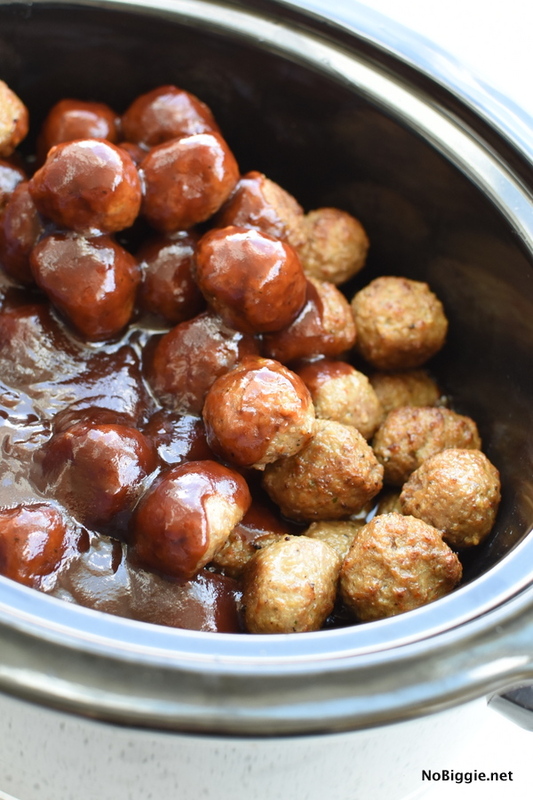 BBQ Cranberry Crockpot Cocktail Meatballs are the perfect party food for tailgating Game days and parties. This is one of those easiest ever recipes you can throw together in a few minutes. Perfect for a hostess (Hostess with the Mostess!) who’s got a bunch of other food to prep. 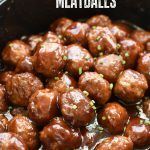 The best part of this recipe is how easy it is, just three ingredients thanks to pre-made freezer meatballs. 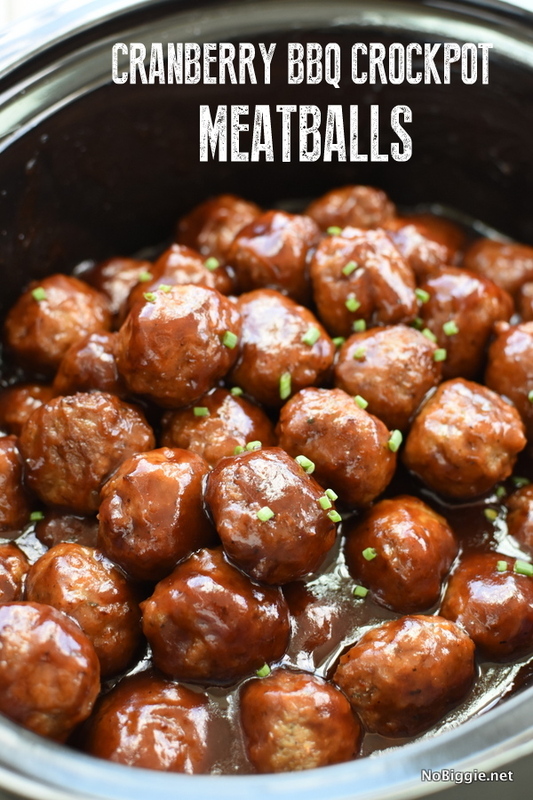 There’s a few variations of these meatballs, some with grape jelly mixed with bbq sauce and others with just straight bbq sauce. This version with jellied cranberry sauce is so good…tangy sweet and spicy. 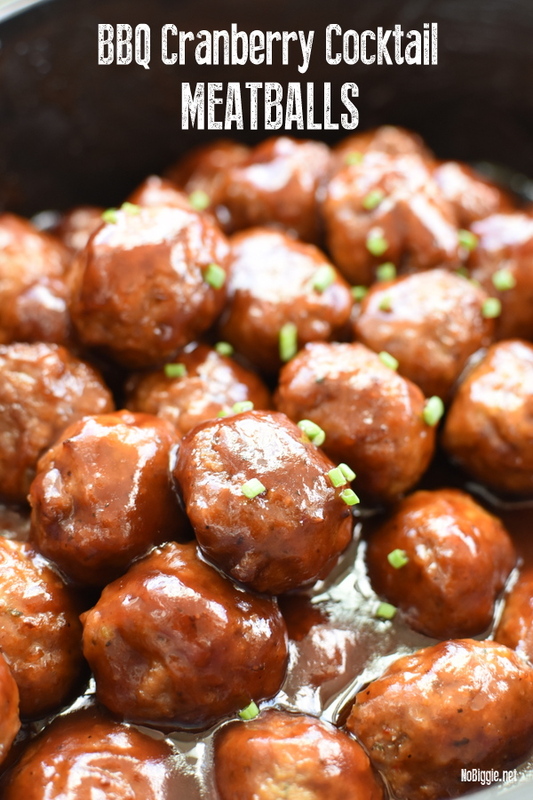 These meatballs are always the first to go at every party. You might be wondering why I’m sharing this recipe here because it’s so dang easy, but we recently had an appetizer night with friends and a few asked for the recipe, so I wanted to add it here. It’s always a go to for us for parties and get togethers. 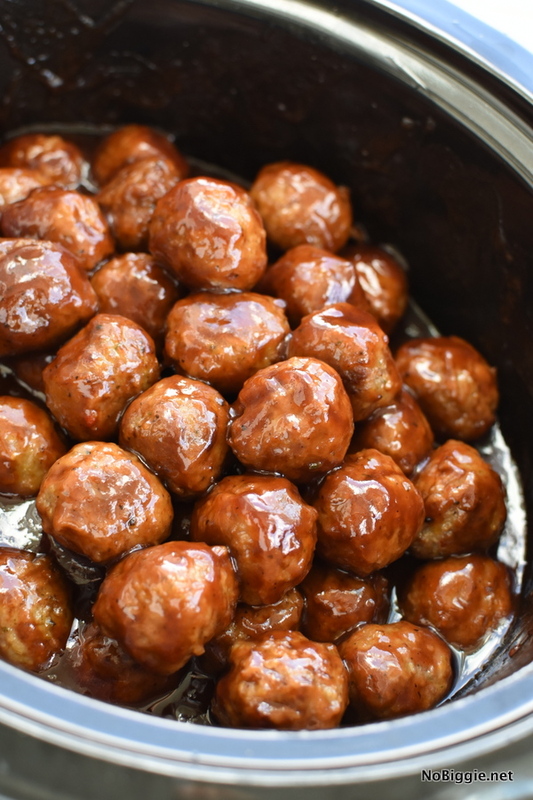 Here’s the thing about slow cooker cooking, it’s great if you plan ahead for the long cook time, but the last time I made these I was short on time, so baking these meatballs in the oven to warm through before tossing them with the sauce in the crockpot was a time saver. 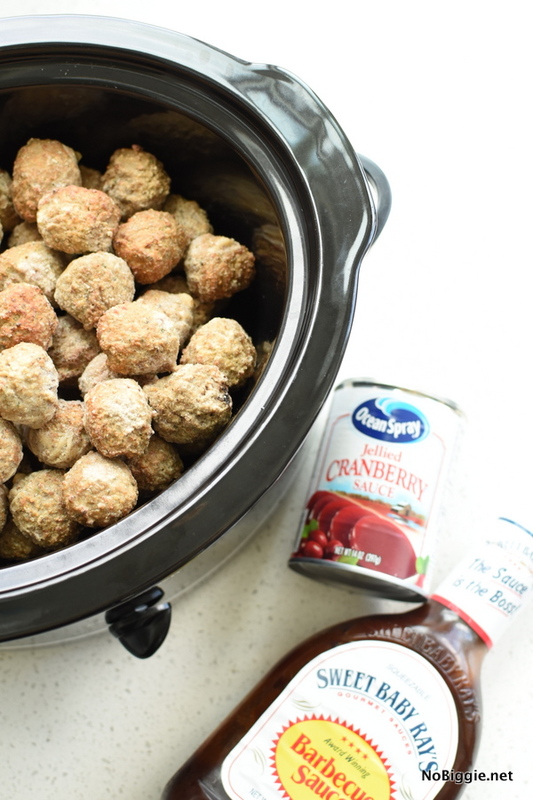 We served them in the crock pot, it’s a great way to keep them warm during the party. Do what ever works, but it’s always nice to know you can bake them in the oven if you forget to plan ahead for the cook time needed. In a sauce pan on your cook top set to medium high temp combine the jellied cranberry sauce with the bbq sauce. As the cranberry sauce starts to liquify, whisk together with the bbq sauce until combined. 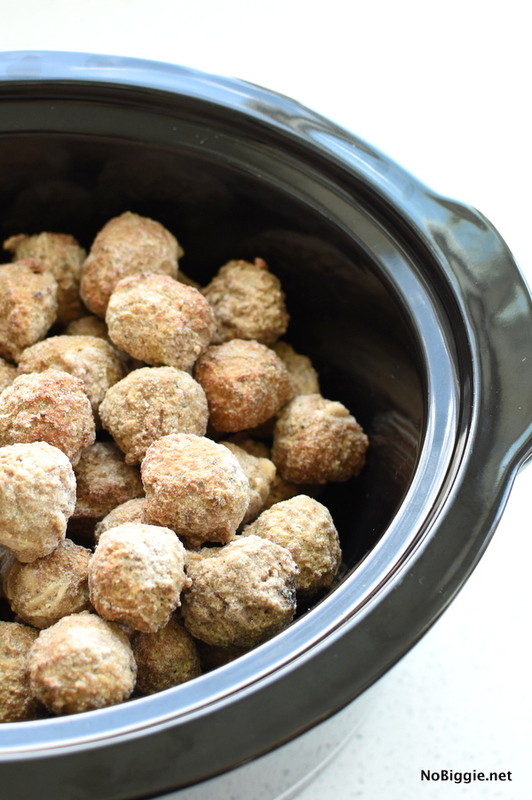 Add thawed meatballs to the bottom of the slow cooker, pour the sauce over the top and stir to coat all the meatballs. Garnish with snipped chives. Serve and keep in slow cooker. Optional Cook Method for when you are short on time: BAKE them in the oven at 375 for 16-20 minutes on a sheet pan covered in tin foil (for easy cleanup). After baking move warmed through, cooked meatballs to the slow cooker to coat with the sauce and keep warm while serving. The awesome thing about this recipe is that you can keep all three ingredients on hand all the time. 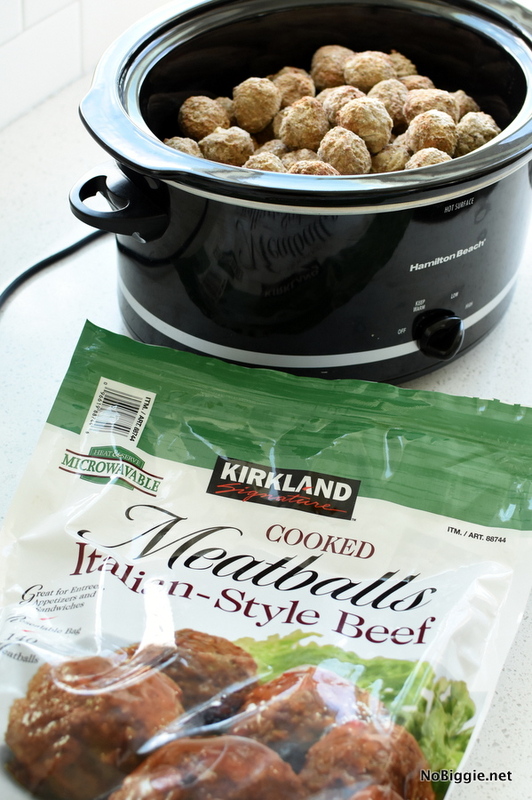 We love to buy the big bag of meatballs from Costco. We usually use half of the bag. Sweet Baby Rays BBQ sauce and Jellied Cranberry Sauce are both great pantry items to always have on hand. We recently started growing chives in our yard, and I love them! They are so easy to grow and keep alive, which is a must for me because I some how seem to kill everything. For a simple garnish (totally optional), snip a few chives over the meatballs right before serving. Adding a little green is always a nice touch. Fresh Italian flat leaf parsley is a great green garnish option too. What are your favorite party appetizers?